The mountain lion (Puma concolor) is the second largest cat in the Americas after the jaguar. While it's a big animal, the mountain lion is actually the largest small cat. It's more closely related to the domestic cat than to the lion or tiger. Puma concolor holds the Guinness World Record for the animal with the most common names. It is known as the mountain lion, cougar, puma, catamount, and about 40 other names in English. In keeping with its Linnaean name, scientists call the cat a puma. The mountain lion is the fourth largest cat in the world after the tiger, lion, and jaguar. The cat's coat is tawny on top and lighter on the belly, leading the name "mountain lion." Males and females look similar, but males tend to be larger. Males average around 7.9 feet from nose to tail tip, while females average 6.7 feet in length. In general, adults range from 4.9 to 9.0 feet long. Males weigh 117 to 220 pounds (average 150 pounds), while females weigh between 64 and 141 pounds (average 121 pounds). Although mountain lions are large, they are not considered to be big cats because they cannot roar. However, they can produce a distinctive scream known as caterwauling. The mountain lion has the largest range of any terrestrial American animal. It is adapted to diverse habitats from the Yukon in Canada down to the southern Andes in South America. In North America, mountain lions have been extirpated in the eastern half of the continent, with the exception of the Florida panther. Like other cats, the mountain lion is an obligate carnivore. While deer are its most important food source, the mountain lion will kill and eat anything it can catch, ranging from insects all they way up in size to moose. The mountain lion is an ambush predator that stalks its prey and pounces. It uses its bite to break its victim's neck or else suffocate it. Following a successful hunt, the mountain lion drags its prey to a cache and hides it with brush. It returns to the cache to feed over the course of several days. Like most cats, mountain lions are crepuscular and tend to hunt before dawn and after dusk. Mountain lions are solitary except during mating and, for females, when caring for cubs. Although females are in estrus for 8 days of a 23-day cycle, they usually have only one litter every two or three years. After mating, the pair separates. Gestation last 91 days. The female seeks a cave or other protected space to give birth and rear her young. She most often gives birth to two cubs, although a litter may range from one to six cubs. The kittens are born blind and have spotted coats. When the cats' eyes first open, they are blue. Cubs are weaned around three months of age and remain with their mother at least two years. Juveniles lose their spots around two and a half years of age. On average, one in five kittens survives to adulthood. Females become sexually mature between one and a half to three years of age. Males must establish their own territory before they can mate. In the wild, the average life expectancy of a mountain lion is 8 to 10 years. The cats may live much longer in captivity. Here, the average lifespan is about 20 years, but one cat died just short of its 30th birthday. The mountain lion and a leopard can mate to produce a hybrid called a pumapard. Pumapards exhibit dwarfism and grow to about half the size of their parents. The hybrids have bodies of pumas, but with unusually short legs. The coat pattern is more similar to that of the leopard. The base color is tawny or gray with either brown or faded rosettes. 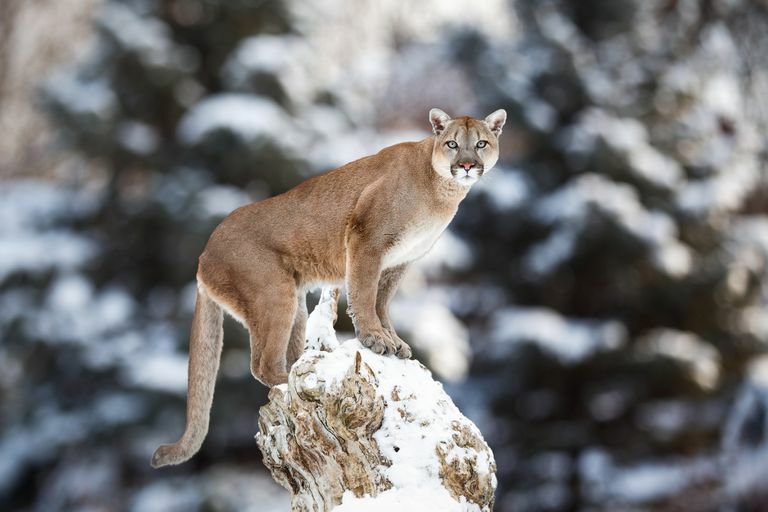 The IUCN categorizes the mountain lion's conservation status as "least concern." The IUCN estimates fewer than 50,000 cats remain in the breeding population and the number continues to decline. Mountain lions face multiple threats to their survival. Human encroachment has led to habitat loss, habitat degradation, and diminished prey availability. Breeding populations are becoming increasingly isolated and at risk of inbreeding depression. While the cat is protected in part of its range, hunting remains common in many countries, including the United States and Canada. Mountain lions are also susceptible to feline immunodeficiency virus, which may be spread by domestic cats. Mountain lions rarely attack humans because people are not recognized as prey, but the number of attacks has been increasing. As of 2004, 88 attacks and 20 deaths had been recorded in North America since 1890. Most attacks occur when humans encroach on a cat's territory or when the feline is starving. Children are much more likely to be attacked than adults. If threatened by a mountain lion, the best defense is to fight back. Running away, standing still, or playing dead are all ineffective strategies. Mountain lions are occasionally kept as pets, although there are cases of the cats attacking their handlers. A pet puma named Messi has a large following on YouTube. Beier, Paul. "Cougar attacks on humans in the United States and Canada". 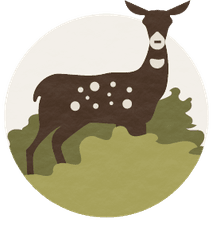 Wildlife Society Bulletin. 19: 403–412, 1991. Subramanian, Sushma. "Should You Run or Freeze When You See a Mountain Lion?". Scientific American, April 14, 2009. Wozencraft, W.C. "Order Carnivora". In Wilson, D.E. ; Reeder, D.M. Mammal Species of the World: A Taxonomic and Geographic Reference (3rd ed.). Johns Hopkins University Press. pp. 544–45, 2005. ISBN 978-0-8018-8221-0.